The picture of the poet starving in the interval between writing two pieces that nobody wants to publish has burnt pretty well into our minds. But what about painting without being “published”? Those who like doodling will know that not all stuff on paper is suitable for an exhibition – and not necessarily because it is not good enough, but because it is not a painting to be exhibited. It is a doodle, an illustration, or anything else that you simply cannot put in a frame. Of course you can put anything in a frame if you like (who gives a damn about conventions?) but there are some other ways in which you can show your awesome work to wide world. See a few below! This is a very simple way of creating duplicates of your masterpiece. You simply scan your work, you cut it to fit your virtual paper, and then send it off to the printers. You can create a postcard as well as an A2-sized poster, you can print it in whatever size you need. Ready to send off your postcard to gran? 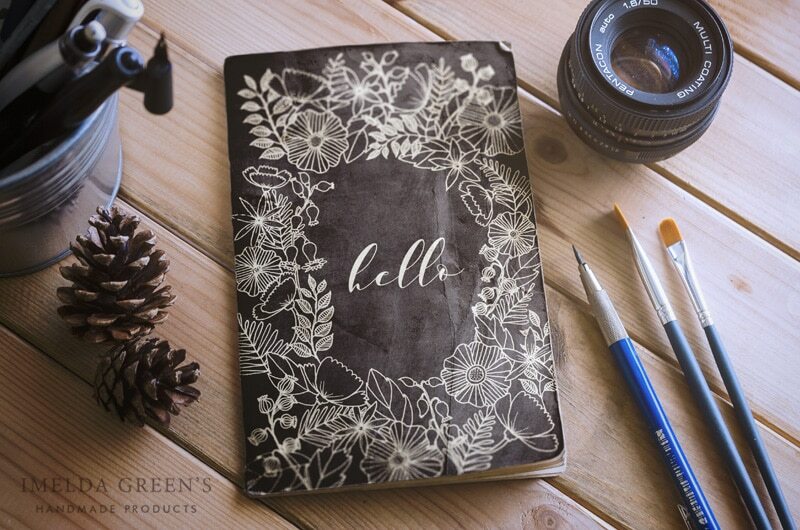 Talking about prints, with a little digital editing you can create the coolest of notebook covers. No more worries about everyone having the same boring designs! For this notebook I used the design from one of my colouring pages after some digital edit. Quotes can make great inspiration or can draw a smile on your face in a gloomy moment. Why not add a few well-chosen words to your beautiful artwork? Some sentences can give really funny extra meaning to an illustration but you can use your repeat patterns for a bit of fun too. 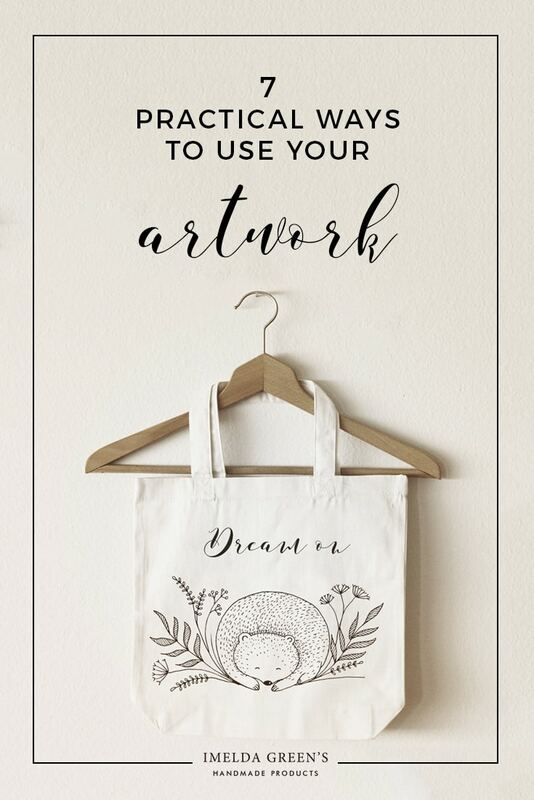 The photo industry has made a fortune on printing pictures of grandchildren, cats and dogs on cotton bags, so it’s pretty obvious: print your artwork on them instead! Believe me, it’s gonna look so much more stylish than a photo, while creating just as personal a present. 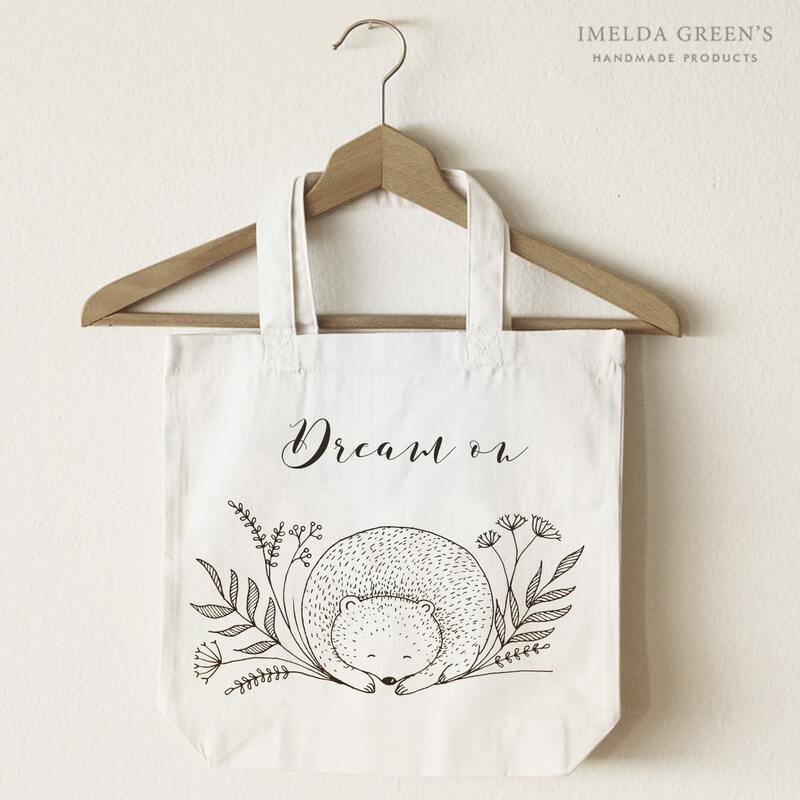 Canvas bag with an Imelda-design on it. This is a personal favourite, which you might have seen applied on my downloadable calendars. You need a little skill for this, as you have to consider the size, scale and permanent elements of the screen you intend the design for. It’s pretty annoying when the date and time is displayed precisely on the sweet face of a little hand-painted fairy. In this case you don’t use quotes but a pre-designed calendar template to add to your masterpiece digitally, then it’s ready to go to print. It makes a really nice Christmas present if you can find 12 fairly consistent pieces in your portfolio. There are plenty of free calendar templates online, and it takes no more than a few minutes to add them to your artwork. How cool is it to wear your own artwork on your skin? 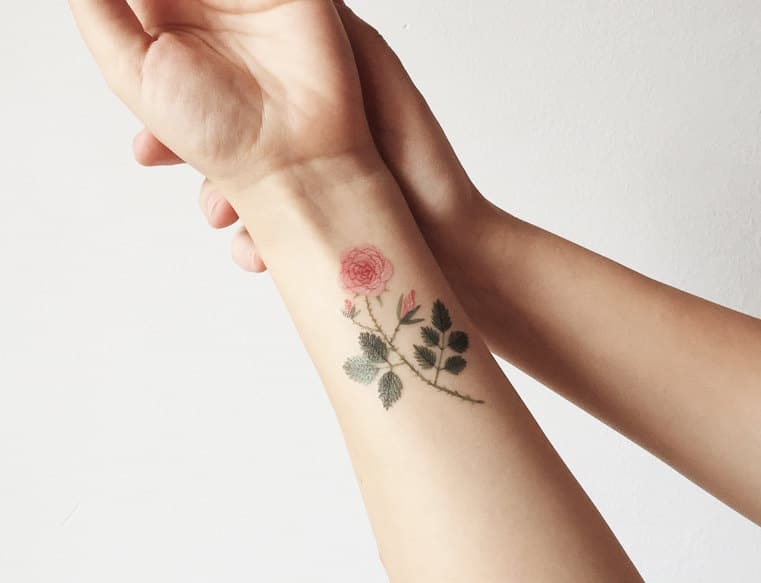 Of course you don’t (necessarily) have to use real ink and needles, there are plenty of printers who will create – apart from the usual bag-mug-pillow collection – unique temporary tattoos. Why not show the whole wild world how talented you are? 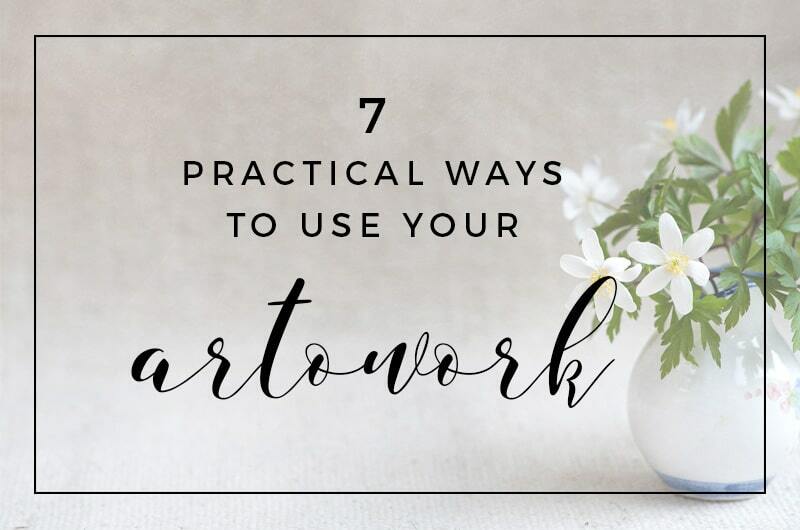 +tip: you can apply these ideas not only with your own artwork but also with your children’s wonderful drawings. These pieces are utterly trendy since Angelina Jolie wore them on her wedding dress, and you bet that all grandmas will melt at the sight of a notebook with a dragon or princess on them made by the little ones. To apply most of the ideas above, you’ll need basic skills in photo editing. Don’t give up, however, even if you’ve never done that before, as I’m planning a free email-course on beginner photo editing. If you’d like to participate, please sign up here so I can let you know when it starts. What do you usually do with your artworks? Do you put them in display or store them in your desk drawer?